WILMINGTON, N.C. — Duke Energy activated a high-level emergency alert at a retired coal-fired power plant in North Carolina as floodwaters from the nearby Cape Fear River overtopped an earthen dike at the facility and inundated a large lake. Duke spokeswoman Paige Sheehan said Thursday that the dam containing Sutton Lake appears stable and they are monitoring the situation with helicopters and drones to react to what she called “an evolving situation.” Company employees notified state regulators overnight that the plant was at the highest level of alert under its emergency action plan. A landfill that was under construction at the site ruptured over the weekend, spilling enough material to fill 180 dump trucks. The 1,100-acre (445-hectare) reservoir is a former cooling pond at the L.V. Sutton Power Station in Wilmington and is adjacent to three large coal-ash dumps. The coal-fired plant was retired in 2013 and replaced with a new generating station that runs off of natural gas. A landfill that was under construction at the site ruptured over the weekend, spilling enough material to fill 180 dump trucks. Coal ash contains such toxic heavy metals as arsenic and mercury. Sheehan said the company did not believe any coal ash is at risk of spilling from the site amid the current flooding, as work continues to clean up the earlier spill. The site has received more than 30 inches (75 centimeters) of rainfall as a result of former Hurricane Florence, with the Cape Fear River expected to crest on Saturday. Aerial photographs show widespread devastation to farms and industrial sites across wide swaths of eastern North Carolina, with tell-tale trails of rainbow-colored sheen indicating potential contamination visible on top of the black floodwaters. However, conditions remain so bad more than five days after Florence made landfall that the N.C. Department of Environmental Quality said its inspectors have been unable to visit the hardest-hit areas or collect samples of the floodwater for lab testing. The agency’s regional office in Fayetteville had 1 foot (30 centimeters) of water inside, while other locations were without electricity. State inspectors were able to make it to Sutton on Tuesday and to collect samples from the area around the breached coal-ash landfill. Sutton Lake is now used for public recreation, including fishing and boating. Duke Energy said Wednesday that water samples collected by its employees and tested at the company’s own lab showed “no evidence of a coal ash impact” to Sutton Lake or the Cape Fear River. Thorpe said state environmental regulators were waiting on the results of their own testing before determining whether there were any violations of clean-water-quality rules. Despite Duke’s claims of no evidence of environmental harm to Sutton Lake, the company’s own lab results show chemicals contained in coal ash were detected in wetlands immediately adjacent to the shoreline. An accompanying map shows the sample Duke employees tested from Sutton Lake was collected from the opposite side of the reservoir. Duke’s handling of its ash waste has faced intense scrutiny since a drainage pipe collapsed under a waste pit at an old plant in Eden in 2014, triggering a massive spill that coated 70 miles (110 kilometers) of the Dan River in gray sludge. The utility later agreed to plead guilty to nine Clean Water Act violations and pay $102 million in fines and restitution for illegally discharging pollution from ash dumps at five North Carolina power plants. It plans to close all its ash dumps by 2029. 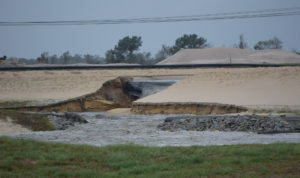 At a different power plant near Goldsboro, three old coal-ash dumps capped with soil were inundated by the Neuse River. Duke said they had no indication those dumps at the H.F. Lee Power Plant were leaking ash into the river. Staff from the Waterkeeper Alliance, an environmental advocacy group, visited the site by boat on Wednesday and took photographs and collected samples of gray-colored sludge and water that they said was washing off into the floodwaters. The group said the samples would be analyzed by a private lab to determine whether the gray muck contained coal ash. State officials said they also have received reports that the earthen dam at one hog lagoon in Duplin County had breached over the weekend, spilling feces and urine. According to figures released Wednesday, four other lagoons had some structural damage, 17 had been flooded by nearby rivers and 21 were so full they overflowed. Large mounds of manure are also typically stored at poultry farms. An environmental threat is also posed by human waste as low-lying municipal sewage plants flood. On Sunday, the Cape Fear Public Utility Authority reported that more than 5 million gallons (19 million liters) of partially treated sewage had spilled into the Cape Fear River after power failed at its treatment plant.